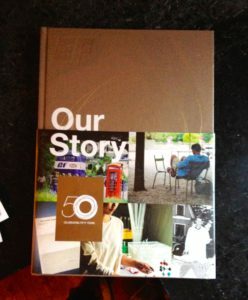 In the summer of 2012, I began a two-year project: creating a 50th anniversary book for EF, the world’s largest private education company. The founder of EF, Bertil Hult, wanted a spectacularly well-designed coffee table book that would tell the story of his company and its strong culture. Bertil, who is Swedish, is a collector of Frank Stella’s work and American Pop Art. He appreciates abstraction, spareness, boldness, silence, and humor — in both obvious and nuanced ways.